Wake Up London were so fortunate to have Sr. Jewel with us at an afternoon of mindfulness on Saturday 15th March 2014. Sr. 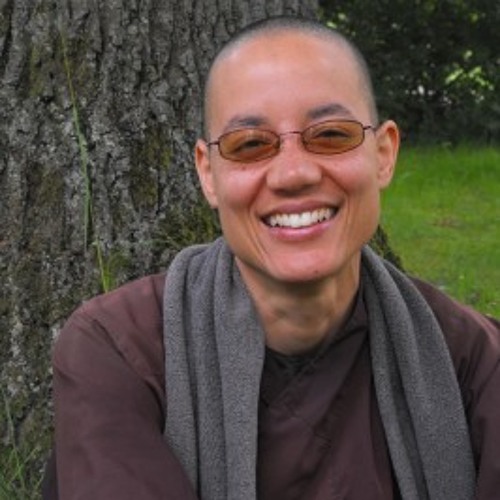 Jewel has been a monastic student of Zen master Thich Nhat Hanh for 14 years and a dharma teacher for 7. She is from the US, grew up in Chicago and Nairobi, and loves sharing the practice with children, young people, teachers, passionate about bringing mindfulness to the arts, exploring spirituality and creativity, and reconnecting with nature. She has offered many retreats for artists, hiking retreats, family retreats, retreats for teachers. Sr Jewel has been based for the last 5 years at the EIAB (European Institude of Applied Buddhism) in Germany and is now taking a year to travel and teach in the US, Europe and Southern Africa. After leading an energizing session of InterPlay - a practice that helps to "unlock the wisdom of the body", Sr Jewel offered an inspiring talk that touched on various subjects: Sr Jewel shared about her happiness recently in co-facilitating a course called "Economics of Happiness" at Schumacher College, in Devon. She introduced mindfulness throughout the course, including walking meditation in the afternoon, did some Interplay and dancing in the evening... Inspired to see what is happening in the world, in terms of creating economic, social, political, structures that really aim to create well-being and happiness, rather than more and more growth or profit, at the expense of our happiness. Impact of Sangha - anytime we make shifts inside, it ripples out to society. Climate Change through the perspective of The Four Nutriments - teachings of the Buddha. Look to see what has fed what we are experiencing. Four kinds of food - "nutriments" - what are the causes of suffering, how has we ourselves or the environment we are in has brought about it? What has fed it? What are it's roots? Understanding this is the key to liberation. The Four Nutriments are: - Edible food - Sense impressions - images, sounds books conversations, advertisements - Volition - what are our real wish for our lives is, what motivates us? What gets us up in the morning? What energizes us? - Consciousness - all our past experiences and impressions we stored deep in our store consciousness - which can be either individual or collective eg. the collective consciousness at a football game can penetrates us and effect us in many different ways. Buddha gave images for each of these kinds of food. The image for volition: man in a village where there is a huge pit of burning coals. The man knows if he gets near that pit, he will get thrown in and die so he goes to another village. Volition is like that. Often where we put the focus of our life, draws us into suffering. So if we focus on external kinds of gratification, such as status of power, fame, pleasure, then we cut off from a deeper fulfilment, an awareness of our connection with all beings. That's a force pulling us into a pit of fire. Buddha invites us to examine our volition. What is it that is deeply motivating us in our lives? It is so important to investigate this, because if we don't have a clear sense of where we are going, our volition can get easily hijacked by our society, a consumer driven society sees humans as consumers. Consuming keeps our economic system functioning. We are being told that's where our happiness is. If we don't really look at why we're on this planet, what is our purpose, what we want for our lives, then we may find ourselves going very far away from real happiness. Volition as individuals. Volition as society, collective. Volition that pulls us into burning fire. Effects of our behaviour on our planet. This focus on needing to always maintain material success and secure a sense of solidity, keeps us too busy to make us respond to what is happening to the world. Consumption - fuelling the destruction of our planet - is presented as an escape. Quote by article by Kathleen Dean More: "Let’s face it: our culture is hooked on cheap oil and consumer goods, and we exhibit all the self-destructive behaviours of addicts. We devote our days to the pursuit of the next hit. We have developed enabling behaviours to allow our addictions to go unchallenged, to deny that they do any harm. I think the addiction to consumer goods is a response to the loss of community, self-sufficiency, meaningful work, neighbourly love, and hope. When these things are taken from us, we look for the cheap fix, which is turning out to be very expensive indeed." (Full interview: http://thesunmagazine.org/issues/444/if_your_house_is_on_fire) Joanna Macy: "The larger body we are apart of is in trauma, so we are too" Avatamsaka Sutra: "Because the world is sick, I am sick" Short workshop with Joanna Macy, deep ecology systems thinker, on how we can heal the destruction of our Earth. This trauma we are experiencing, gets pathologized and we get told it's our personal problem. We need to dare to say this ill-being is not normal, it's not our own individual problem... it's really something bigger than us as well... And Joanna Macy also speaks about the importance of gratitude. Messages from society says we are not sufficient, not okay as we are, instils in us the sense of inadequacy and neediness. To be grateful for all the many things that do fill us is politically subversive. Gratitude is a revolutionary act. Oren Lyons, Native American faith keeper of the Turtle Clan calls for a global council of elders - such as Jimmy Carter, Thay (Thich Nhat Hanh), Desmond Tutu, Mary Robinson - people who have really stood for peace their whole lives. He suggests can get together and choose one company to be the target of a global boycott. "How many points would the targeted company’s stock have to drop before it entered into negotiations and transformed itself? Then the council of elders could choose the next company, and the next." Sister Jewel is inspired by this idea and will be putting energy into helping this manifest. This hasn't been tried yet. If you are interested in supporting this idea - please email info@wakeuplondon.org and we'll pass you onto to Sr. Jewel.